The reason why I advocate these rules are for the sake of consistency to achieve a specific gameplan, a must in competitive play. There is another strategy to deck building Commander decks I haven’t discussed; it’s the “I can take whatever you throw at me” approach to deck building. Rather than building for your gameplan, you’re building for the gamestate. In the words of “His Holiness Sheldon Of The Immaculate Banlist” you can Embrace The Chaos and try to master it. Here’s a diagram that demonstrates the tension between gameplan and gamestate. It’s applicable to any sort of deckbuilding, not just for Commander, but in this format it pushes you to the left of the spectrum, where as you can consciously choose to push to the right. An unmolested gameplan will always win; that’s why goldfishing a deck always produces unrealistic results. No plan survives intact first contact with the enemy. The question then becomes how resilient your deck is to disruption, and how capable of disrupting the plans of your opponents. 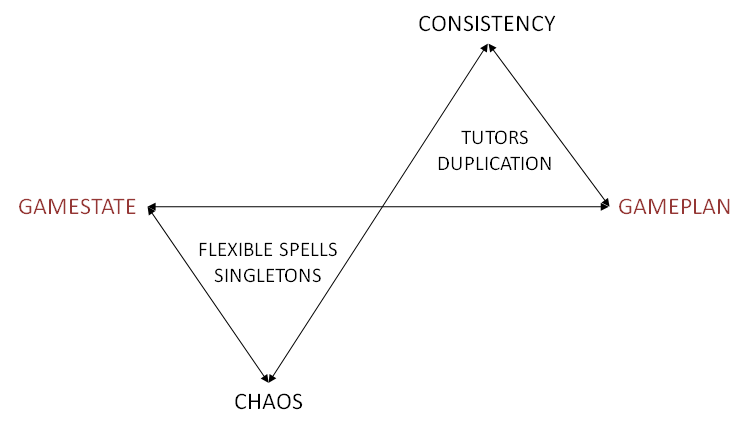 I advocate a strong resilience through Tutors and Consistency of function through ‘duplication’ of card effects. This is very good at creating situations that make it difficult for your opponents to stop you achieving your end plans. However another school of thought is that your decks should have as many ‘silver bullets’ as possible in order to deal with whatever is thrown at you. This is where the philosophy of ‘packages’ comes from (such as Trinket Mage packages and Stoneforge Mystic packages, etc.). This approach allows you the consistency to tutor up the exact card you need to put a spear through your opponent’s gameplan. This school of thought still borrows a great deal from the ‘search and destroy’ approach to deckbuilding. Modal spells begin with “Choose one -” followed by various effect choices, or modes. There have been many modal spells in the history of Magic, from Healing Salve through to the Exarch cycle in New Phyrexia. Here are some of the best. There are two basic types of charm, monocolored versions and the 3-color charms. Both versions three ‘modes’ of choice and no ability to select more than one version. Most of the monocolored charms are decidedly lacking in power, but there are some of note. Evolution Charm: Has three largely useful effects. You can use it to ramp, recur a creature, or as a combat trick for your big green ground pounders. The first two are highly regarded in any ramping green deck, and although the first mode is no Rampant Growth it does help in those early turns when finding land is a must. The fact that it is instant also helps you use the second mode to rescue a recursion piece form the graveyard after being targeted by graveyard hate. Dawn Charm: A fog, a regenerate, and a counterspell are nothing to sniff at. Very few people run these types of effects in white so few will see any of them coming. The fog can be useful against game-ending commander or fast infect damage, especially when you can crush on the back swing. The Dawn Charm effect hits Bribery, Acquire, Duress and any other number of disruptive spells. Hearth Charm: In Commander this is no end of artifact creatures, so the first ability will usually have something to hit. As part of a pressure deck or goblin-tribal theme, the second ability is great. And if, for some reason, you need to push through that Goblin Lackey you can probably get some use out of the third mode as well. Piracy Charm: In a heavy blue metagame this card is solid. The islandwalk granting mode can be a kick in the pants, the second mode kills most Wizards, and the hand disruption at instant speed is brutal when stuck under an Isochron Scepter. Bant Charm: There is so much to love about this card. It destroys Sol Rings, ‘tucks’ commanders (into their library), and counters counterspells. All three modes are powerful effects, and at instant speed even more so. Possibly the best of the tricolor charms. Chrosis’s Charm: It’s a Boomerang, a Doom Blade, and a Shatter, which are three effects that are always applicable in Commander. The nonblack requirement on the second mode is frustrating (oh only if it were Terminate instead) but the utility in bouncing any permanent with the first effect more than makes up for it. Esper Charm: The Disenchant ability is generally the least used mode of Esper Charm as the next two effects are so good. Instant speed, no-downside, draw-two or double-discard for three mana simply doesn’t exist in Magic outside of this card. That makes Esper Charm an amazing card. Naya Charm: The deal-three-to-a-critter mode isn’t fantastic in Commander, but nor is it useless. The recursion of the second mode is nice; but it’s the third mode that’s the best. Forcing a turtling player to tap all their defensive critters at the end of their turn is one of Commander’s best face-slaps. Most decks playing this colors want to attack; this card is great at allowing that to happen. The Command cycle came out of Llorwn block and pushed modal spells to their power limits. Each Command has four modes. The only card everyone remembers all the options to is Cryptic Command (quick, name them!) but the others are all worth remembering as well. As there were only five, I’ll talk about each one. Austere Command: Probably the best of the Commands for casual Commander, Austere Command grants flexibility for dealing with a lot of different types of permanents. Whether it’s big creatures, small creatures (such as tokens), frustrating enchantments. or dominating artifacts, this spell can deal with them all. The best thing about it is you can do so surgically, destroying what you need to while generally leaving your army intact. A very smart card. Cryptic Command: Probably the best of the Commands for competitive Commander, Cryptic Command is still the powerhouse it was when abused by Faeries and Five Colour Control. All the modes are good. Whether it’s unconditional countering, a boomerang effect, tapping an opponent’s creatures out, or drawing a card, every mode has its uses. Also, it’s the only Command that operates at instant speed, an auto-include in just about any blue control Commander deck ever. Incendiary Command: To be frank, this card doesn’t float my boat. Even the hand-disruption fourth mode doesn’t thrill me, even when you’re trying to abuse a mechanic built around it. It’s big, it’s slow, and it generally doesn’t do enough. Primal Command: The modes are gain 7 life, Excommunicate a permanent (including a commander if desired), shuffle away a graveyard, or tutor for a creature. This gives Green a deck access to a ‘tuck’ effect (by choosing modes 2 & 3), which can be devastating against certain decks (eg. Jhoira of the Ghuitu, Arcum Daggson). Tutors are always good, and 7 life isn’t inconsequential in Commander. Profane Command: Even if you’re not Patrick Chapin you can still get a lot of utility out of this. Most monoblack decks are capable of creating vast amounts of mana and therefore the drain-life-without-the-lifegain first mode is relelvant. The second mode recurs creatures straight back onto the battlefield, which is a powerful effect. The third mode is capable of killing indestructible critters, and the fourth can make your presumably-zombie army unblockable. All are fine modes, making Profane Command a highly inclusive card. Entwine cards are modal, but with the upside of paying the Entwine cost to activate both modes at once. There are 24 modal spells in all, with Tooth and Nail the Commander poster child for the Entwine mechanic. Here are some of the better ones. Betrayal of Flesh: Okay, it’s expensive. But it’s one heck of a combat trick, killing just about any creature on the board while getting your best creature from the graveyard back onto the battlefield. I’m not sure whether you’re willing to pay 6 mana and three lands for the effect, but it is certainly worth considering. Grab the Reins: It’s a little bit Act of Treason, a little bit Fling, but for six mana you can instantly grab any creature without shroud (or hexproof) and remove it from the board while nugging an opponent. A very nice option for alternate creature removal. Journey of Discovery: There are more favored ramp spells out there but I happen to have a soft spot for this one. The first mode is worse than Cultivate, and the second worse than Exploration, but together they do marvelous things. I’m never unhappy to see it in my starting hand, which means a lot in Commander. Promise of Power: It’s not hitting anything other than a heavy-black deck, and like Betrayal of Flesh the cost is extraordinary (9 mana to get to entwine), but the upsides are delicious: putting an at least 5/5 beatstick into play and drawing 5 cards. The loss of life is barely a scratch in Commander. Unless you’re at 5 life, in which it becomes a take-your-chances Demon summoning spell. Reap and Sow: Mwonvuli Acid-Moss does it cheaper, but is restricted to tutoring for Forests. This allows you to go grab any land, which is a nice piece of utility. If you’re going the mana-denial route, however, they probably both belong in the same deck. Savage Beating: BOOM! How much fun is this card? I mean, just look at the guy in the picture, happily coming to plant his fist between some blue mage’s teeth. Seven mana is a lot to spend, but you’re going to do so to win the game by giving your creatures an effective “quadruple” strike. Tooth and Nail: As mentioned, this is the entwine card people think about when they talk about Commander. It is also part of the reason Painter’s Servant is banned in Commander. My current favourite duo to go for is to go for Melira, Sylvok Outcast and Woodfall Primus with Greater Good on the board to cause infinite land destruction with infinite card draw. Hopefully Melira will be fixed on MtGO soon so this can actually be pulled off. Meanwhile, if you’re running green, you’re running this. Brutalizer Exarch: I underrated him when I first saw him, but having played with him a little, I confess he’s pretty damn good. Able to get rid of troublesome lands and equipment, and able to tutor up creatures you need while holding down the fort: he’s a competent little package. Worth considering in any deck running Green. Deceiver Exarch: Essentially a combo piece with Splinter Twin or Kiki-Jiki, Mirror Breaker, he’s a second Pestermite for those looking to add consistency to their combo deck. Entomber Exarch: A more flexible gravedigger, don’t read the second mode wrong. A lot of people assume it’s ‘choose a creature card’, but it isn’t. It’s ‘choose a non-creature card’. I’m not sure if that makes it a better card or not, but a Duress effect on a bear is pretty interesting. Tormentor Exarch: The -0/-2 ability is cute, but will hardly turn Commander on its head. Grim Discovery: A great card that deserves more play. Hull Breach: An amazing little card that can take out a just-cast Erayo and the Sol Ring used to power it out. Invoke the Firemind: What a lot of UR decks look for, the flexibilty to get ahead on cards or just end the game. Soul Manipulation: A savage beat when masterfully played in a UB control deck. Split cards offer all sorts of flexibility tricks for rules lawyers familiar with how split cards work in regards to the mana costs of the individual ‘split’ cards. I really suggest reading the MTGSalvation Wiki on Split Card rules to learn more about them. Crime // Punishment: It’s the ‘or enchantment’ rider on Crime that thrills me. Stealing someone else’s Mana Reflection or Moat seems like a fine use for a card as it’s completely unexpected in white-black-green. The pseudo-Engineered Explosives effect is also highly useful for surgical strikes against opponents, especially tokens. I don’t see a lot of white-black-green decks around, but that’s likely to change once the Commander decks are released. Life // Death: Exhume isn’t fair. Death is only slightly more fair as you can only grab your own creatures, but as a back-up it’s not half bad. Green-black decks love their creature recursion while ramping out lands, so I can see both sides of this split card seeing play. Fire // Ice: It’s the Isochron Scepter imprint of choice in various formats, though not as powerful here. Still, it’s hard to ignore the ability to tap down any permanent while drawing a card, or ping a couple of opponents for 1 each a turn, even in a beat-heavy format like Commander. Supply // Demand: There are a number of sweet token strategies in Bant decks and Supply can happily help out with this. Demand is a little more selective on the tutoring front, but with the range of new gold cards coming out specifically for Commander this card is likely to have more targets than ever. Spite // Malice: A sweet card for blue-black control decks, you can either repair the damage done when an opponent gets a creature through your countermagic net, or prevent one of your own creatures being nuked by a removal spell (or even help win a counter war). Kicker and Multikicker cards are useful as you get a reasonable effect for a reasonable amount of mana, or a great effect for just a little bit more. Here are some of the better ones. Ana Battlemage: This guy doesn’t just pack a kick down low, but also a sock to the jaw and a smack to the head. As a bear he’s pretty useless, but he can force a player to discard three cards while dealing damage to that player (or another) at the same time. Why he requires Blue instead of Red is entirely up to the mysterious thinking of the Planar Chaos design team. Thunderscape Battlemage is so jealous. Citanul Woodreaders: For six mana you get a blocker plus two cards, which isn’t the worst thing ever to happen in green. Not competitive playable, however. Comet Storm: Once you have a large enough mana pool, this card becomes a real threat to everyone else sitting opposite you. You can strike instantly, yes instantly, at any number of creatures or players to take them out hard and fast. It’s disappointing more people don’t play this Fireball variant as it’s just made for the big-mana Commander environment. Desolation Angel & Desolation Giant: No one has ever played either of these and not paid the kicker. They are truly Commander worthy, through if you do decided to blow up the world make sure you can end the game fast afterwards. Dismantling Blow: A fine removal spell that more than replaces itself. Everflowing Chalice: A card that loves to be abused with proliferate, Everflowing Chalice is a fine colorless ramp spell. Gatekeeper of Malakir: Cruel Edict effects can be a bit hit-and-miss in Commander, but they’re always good to have around against people playing with indestructible or creatures with shroud. Certainly a fine card for monoblack control decks. Joraga Warcaller: An absolute beast in Elf tribal decks. Thank goodness they didn’t give him a name and make him legendary, or he may well of needed to be banned. Kangee, Aerie Keeper: A very expensive Joraga Warcaller for the bird tribe, Kangee is a fine casual commander. I have a Kangee deck myself and it’s a blast. There a few people still willing to sling Thieving Magpies across the kitchen table, and they’re always welcome around my place for a beer. Marshal’s Anthem: A sweet little card that can be heavily abused with enough mana. Note that it brings the creatures directly back onto the battlefield, bigger and better than ever. This can be backbreaking for decks not equipped for that kind of sudden burst. Orim’s Chant: This is the single best thing to get under a Turn 1 Isochron Scepter, if you can manage it. Strictly a competitive format card; not casual at all. Rite of Replication: This is the type of card that stories get told about. Paying 9 mana to put five of any creature into play is ok, but when those creatures are all copies of your opponent’s Blightsteel Colossus? That’s a great story. I’ve always enjoyed the moment when this is cast, and especially enjoyed it when the effect is Misdirection’d at a lowly saproling token. A beautifully designed card for those moments that make Commander truly enjoyable. Sphinx of Lost Truths: He’s a decent flier with terrible dreadlocks, but anything with ‘draw three’ on it is worth playing, especially in blue. Even if you think of him as an overcosted Ancestral Recall with a 3/5 flyer attached, it’s still Ancestral Recall and that card is good I hear. Wolfbriar Elemental: Speaking of putting tokens into play, here’s a guy who gets the job done. After the cost of playing a 4 mana 4/4, you then get the option to put another 2/2 into play for every extra Green you spend; and what Green deck doesn’t have mana to burn? I’ve been blown out by this card several times and I’m sure will have it happen again several times more. A card that cycles is never a dead card (alright pedants, if you have no cards left in your library it’s a dead card, congratulations!). Its ability to replace itself means you have the flexibility to try your luck top-decking into something useful at all times. There are a few types of cycling cards. The first are cards the straight cyclers (ie. have ‘cycling’ printed on them but do nothing more). The second are cards that cycle for specific cards (eg. landcycling, slivercyclers). The third are cards that cycle for effect (ie. have “When you cycle this, do X” on them). Vedalken Æthermage: A card that is an uncounterable tutor for Wizards is pretty tight in blue. The fact it allows you to tutor back Azami, Lady of Scrolls that’s been Hindered away, making it pretty invaluable in that type of archetype. The flash and the ability to bounce two other popular commanders, Sliver Queen and Sliver Overlord make it that much better. Homing Sliver: One of the most seriously abusable cards in the Sliver arsenal. Slivers are the tribe that’s best at the ‘silver bullet’ effect and this card pushes the deck into overdrive, turning every Sliver in hand into an uncounterable tutor. That’s seriously impressive. Absorb Vis: An eight-point life swing isn’t terrible late game, but it’s the early game ability to ensure hitting three mana that counts. Black hardly needs another tutor, but this isn’t the worst option at its disposal (I’m looking at you, Diabolic Tutor). Traumatic Visions: It’s a hard counter that can be flushed away to help ramp. That’s fine in mono-blue, although there are various other cards a Competitive blue player will use before resorting to this. Decree of Annihilation: Regardless of whether you cycle this or cast this, you’re getting value. Just be sure you have a plan on how to end the game after you do, because no-one enjoys starting the game from scratch again without there being some sort of purpose. Decree of Justice: A great end-game card, it’s expensive to activate but well worth it. The tension between having the 4/4 flying angels that might be countered, or the certain army of 1/1 soldiers is sweet. Decree of Pain: The base effect of this card is absurd, the cycling effect merely very good. Great at hosing the board, or just other people’s token strategies (or Wizards, I might add). Krosan Tusker: The first non-Decree on this list, he’s on the list because, quite uniquely, he cycles for two cards which is excellent card advantage for green mages. Resounding Silence: It’s playable as written, but can be brutal when cycled as it’s an effective 3-for-1. I have a soft-spot in my heart for this card as I rode it to a Top 2 spot in a PTQ in Sydney once. The mana is not easy, but achievable in Commander without too much hassle. And there you have it. A whole bunch of cards that can add flexibility and, dare I say it, chaos to any deck. Naturally I would advocate a sensible mix of flexibility and consistency, but at the end of the day it’s up to you on how you choose to build your deck. Will it be with certainty, consistency and resilience, or with flexibility, variety and adaptability? Let me know in the comments what you think about consistency versus flexibility for consideration for the deck-tuning article coming next week! « Ach Hans, Run! It’s the Humility! Primal Command can't tuck creatures but otherwise a good article. I believe Hide//Seek is the best split card in Commander.